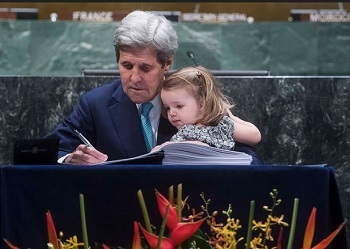 WASHINGTON, DC, May 5, 2016 (ENS) – The historic Paris Climate Agreement signing ceremony at the United Nations on April 22 has given rise to this week’s Climate Action 2016 Summit, where global leaders from government, business and civil society are meeting for two days to showcase actions underway to make the agreement a success. The 175 national governments that have signed the Paris Agreement will need the support of international organizations, the private sector and civil society; Climate Action 2016 acts as a platform for the activities of these players. Co-hosted by a broad coalition of partners at the Mayflower Hotel on Thursday and Friday, the Climate Action 2016 Summit will feature plenary and working sessions with some of the people at the forefront of the climate battle. Senator Ben Cardin, Maryland; Shaun Donovan, US Head of the Office of Management and Budget; Al Gore, former Vice President, United States; Anne Hidalgo, Mayor of Paris; Dr. Jonathan Holdren, Director, White House Office of Science & Technology; Bill Nye, Science Educator; Paul Polman, CEO, Unilever; and Ségolène Royal, France’s Minister of Ecology, Sustainable Development and Energy & President of COP21. Alongside the summit, mayors from around the world will participate in a special breakfast briefing Thursday, hosted by C40 Cities Climate Leadership Group and the Compact of Mayors. Mayors from Paris, Montreal and Atlanta will discuss how cities are implementing climate action following the Paris Agreement, present a new analysis about the barriers cities face in cutting global carbon emissions, and unveil a new joint initiative to help cities overcome those barriers. Livestream Climate Action 2016 at http://livestream.com/Climate-Action-2016/live. For the full list of speakers and the Summit agenda go to http://www.climateaction2016.org/#program. Visit Climateaction2016.org for more information, and follow @CA2016Summit and #climateaction on social media May 5-6 to join the conversation. As the Climate Action Summit opens in Washington, the Science Based Targets initiative announced that 155 companies have committed to set emissions reduction targets in line with the global effort to keep warming well below 2°C as stated in the Paris Climate Agreement. These commitments underpin a corporate climate action strategy as the world transitions to a low-carbon economy. The companies participating in the initiative are headquartered in 27 countries. There are 77 companies in Europe, 34 in the Asia Pacific region, 25 in the United States and nine in Canada. They represent a wide variety of industries, from carbon-intensive industrial sectors to consumer-based industries that include household brands. Forty-one new companies have joined the initiative since the UN negotiations in Paris last December, including Ben & Jerry’s, SunPower Corporation, Owens Corning, Toyota Motor Corporation and the large European retailer Metro AG. Of the 155 companies signed on to the initiative, 13 have already had their emissions reductions targets reviewed and approved by the experts at the Science Based Targets initiative. This means the targets are aligned with the decarbonization necessary to limit warming to below 2°C and meet other best-practice criteria defined by the initiative. At the same time, the grassroots climate action initiative Break Free From Fossil Fuels is sweeping the world, especially during the next two weeks. From now through May 15, individuals and groups are joining together in peaceful resistance against the fossil fuel industry, and in support of a transition to renewable energy. 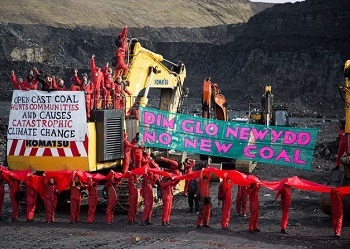 On Tuesday, the UK’s largest open-cast coal mine in Ffos-y-Fran, Wales was shut down for over 12 hours, with no injuries and no arrests. Mobilization organized by the group Reclaim the Power. In the Philippines, an 8,000+ person climate march and rally took place in Batangas City Wednesday. Demonstrators demanded the cancellation of a proposed 600-megawatt coal-fired power plant in Barangay Pinamucan Ibaba. In Toledo, in the Brazilian state of Parana, farmers, students and politicans are gathering Saturday in a mass rally against fracking. energy plan, demanding that the government support renewable sources of energy over coal. In Nigeria, the Health of Mother Earth Foundation will be leading three actions at three important locations in and around the Niger Delta. Many groups are joining the actions in Nigeria to show the strength of the movement to shut oil development down and keep oil in the ground.